Another issue of an occasional series—Dear Adrian—in which I answer questions about event design, elementary particle physics, solar hot water systems, and anything else I might conceivably know something about. If you have a question you’d like me to answer, please write to me (don’t worry, I won’t publish anything without your permission). How much “free” consulting should a consultant offer during initial discussions with a client before requesting pay for services? When consultant and client meet for the first time there’s naturally a certain amount of sizing-up going on. A potential client is looking for a solution to a problem, and is wondering if the consultant can help him, whether he can trust what she says, how much she will cost, how soon she will be available—and all these considerations and more will be taken into account before a decision is made whether to engage her services. A client is hoping to find the help he needs as quickly as possible, but wants to feel confident that the chosen consultant can help effectively for an acceptable price. He may believe that his problem can be fixed easily by someone with the right expertise, and be hoping (or expecting) to get his problem solved quickly, perhaps at no charge. A consultant is wondering what she needs to learn about the client, what the client thinks the problem is, what the problem might actually be, whether she’s capable of helping the client, whether she can get paid what she’d like to get paid, whether she’s going to have the time, resources, and inclination to work with the client in a timely fashion, and so on. From a consultant’s point of view, time spent working to get an initial sense of a client’s needs, determine that he is a fit for her expertise and abilities, and convey enough of her capabilities to reassure the client that she is the right person for the work is non-billable. Too much non-billable time, and a consultant starts to have problems paying her own bills. Naturally, these client and consultant concerns take time to resolve, leading to the above-mentioned Dilemma. I have been consulting for over thirty years and have participated in hundreds of initial client-consultant dances. (I like to think of them as dances: mysterious, exciting, full of the possibility of creating something great together, sometimes disappointing.) In my experience, a contracting minuet can take as little as ten minutes or…well, let’s just say far too long. Client or consultant can trip over any of the obstacles I’ve already listed and decide to walk away. So, what’s a consultant to do? David Allen, of Getting Things Done fame, coined the Two Minute Rule to determine whether a task that interrupts current activity should be handled on the spot—answer: yes, but only, if it can be completed in less than two minutes—or captured to be performed later. I doubt he chose 120 seconds based on some deep scientific analysis, it’s his rule of thumb (which I’ve found to be useful), presumably based on years of experience. In a similar vein I offer my Thirty Minute Rule for resolving the Consultant’s Dilemma. I told Tony that I’ll talk to any potential paying client for up to thirty minutes for free. At that point, if the client is still looking for free advice I’ll gently explore options for transitioning to a paid consultation. Sometimes, of course, it’s clear that we’re not going to move forward. No blame need be assigned, it just happens. Otherwise I’ll generally have enough information to propose next steps. And if my client doesn’t have sufficient trust in me after thirty minutes, then I’ve found it’s unlikely I’m going to change his mind by staying on the call. The Thirty Minute Rule doesn’t include the time required for creating a contracting agreement or proposal. If I judge that we’ve a good chance of creating a win-win consulting arrangement I’ll create a short document and send it to the client for approval. This rarely takes more than an additional thirty minutes. If the document requires significant client-specific research I’ll ask for appropriate compensation to create it. The Thirty Minute Rule is my reasonable compromise between the competing needs of consultant and client. If you’re a consultant reading this, what do you think? 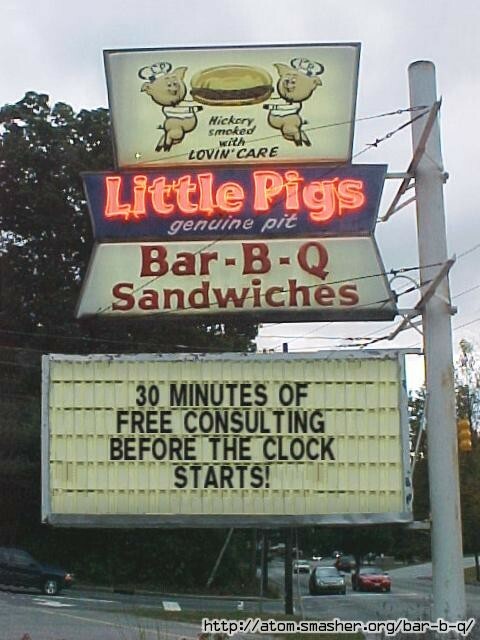 Do you have your own “free consulting time” rule? Feel free to share yours in the comments! Big influences on me at the time were WordPress’s WordCamps, which are also community/peer driven events, and Adrian Segar, who wrote the book on peer conferences: Conferences That Work.